The grandfather of Kiraku wood workshop's owner (Mr. Boss). 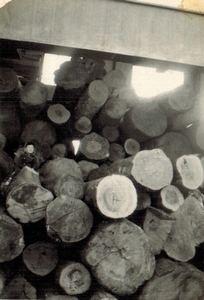 He started a wood business in Fukagawa, Tokyo in 1951. This business is still being carried on by his grandson. 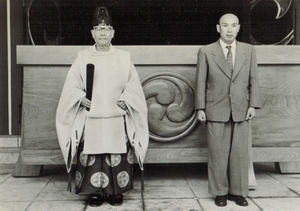 Father of Kiraku workshop owner. He used to run a business of wood, too. 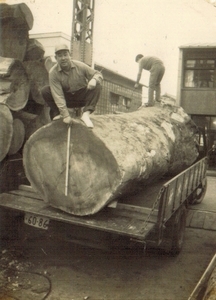 He is measuring the length of a Japanese Zelkova tree in the photo. at a storage of raw wood. The child sitting on on a wood is business owner of Kiraku Woodwork shop. He is the third generation of wood business family, that why he knows a lot about wood.